Eclectic Paperie: New Blog Hop: Part 3 - Be Merry! Only 9 days until it's Turkey Day. Only 40 sleeps until Santa arrives! It's the most wonderful season of all! Time for a fun new blog hop from The E-Team. 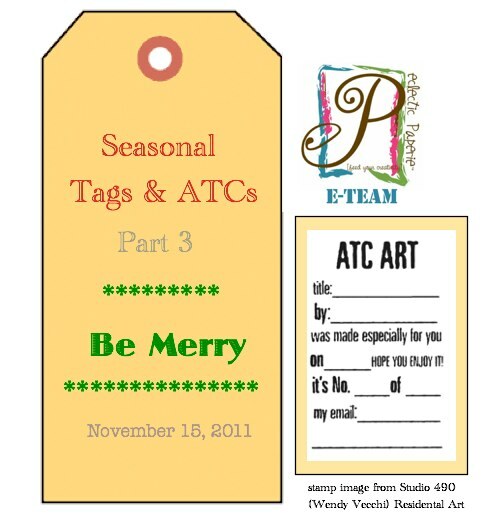 This is Part 3 of our Seasonal Tag & ATC series we are calling BE MERRY! I asked the lovely E-Team ladies to create both a card and ATC using any of their favorite holiday stamp sets, papers, and embellishments. Wait until you see the variety in holiday creations that the E-Team came up with. There is sure to be something for everyone. I can't wait till you see each and every one of the Be Merry projects. You will want to get inky after you see some of them. Visit each of the E-Team members and leave them some feedback about their Be Merry creation. We will randomly choose 3 winners from 3 E-Team blog participant to win an eP box full of holiday themed goodies such as stamps, embellishments and papers. Then leave a comment here on the eP blog for a chance to win 1 of 2 $20 eclectic Paperie gift vouchers. Tell me what is your favorite Thanksgiving dessert. You have from today until Nov 17th to leave comments. All winners will be posted on the eP blog on Friday, Nov 18th. I love the winter holiday season and all the fun that comes with it. Paper crafters go into high gear and all kinds of creations are shared through the Web. Take a break, grab a hot cup of something delicious and a snack. Come see what the E-Team created. I hope you enjoy this Be Merry E-Team Blog Hop. but the list is long - I just love most sweets. Wow..what amazing creations! I was stunned at how beautiful so many of them are! My favorite Thanksgiving dessert is Paula Deens recipe for Pumpkin Pie. It has creme cheese in it. I tried it one year and the girls said mom you need to make this every year..
Daisy, your design team is AMAZING! Fantastic creations from everyone! I didn't grow up with Thanksgiving and don't have a favorite dessert for that Holiday. Sorry! Thanks for having this hop, I love all the creativity I get inspriation from. Loving all these projects. Thanks for this opportunity! What fun your Blog hops are. The E-Team always has such wonderful designs and a great variety of inspiration. Gave me some Christmas enthusiasum!!!! This blog hop was amazing & all the projects were so beautiful! Your design team did an awesome job! My fav Thanksgiving dessert is chocolate cream pie...yummmmm!!! What a great blog hop! If this doesn't put you in the holiday spirit, nothing will! Apple pie is my fave Thanksgiving dessert - yum yum! What a great blog hop! Difficult decision on the favorite dessert. But, I'd have to say my mother-in-laws apple pie is on top. It is to die for!! Thank you for a great hop. Loved all the projects and all the creativity. My favorite Thanksgiving dessert is Pumpkin Pie. My husband is the pie maker and he always makes pecan and pumpkin pies ... but I want the pumpkin and I like it with my mom's recipe. Traditions, you know! Thanks for the chance to win some goodies. Oh, my - as usual your team has outdone themselves! As for Thanksgiving, no pumpkin anything goes in my mouth. I love sour cherry pie! Another wonderful blog hop. The DT projects were just amazing. They really outdone themselves, and I didn't think that was possible. My favorite Thanksgiving dessert is sweet potato pie. Pecan pie tops my list! Thanks for all the great projects. My favorite thanksgiving desert is pumpkin pie. Love this hop theme. Thank you so much for having this Christmas blog hop! I really enjoyed all the beautiful projects! My favorite Thanksgiving dessert is so commonplace - pumpkin pie! Loads of festive creative fun on this blog hop! My favorite dessert is cranberry streusel pie. my absolute favorite dessert would have to be pumpkin pie...can't get enough! What wonderful projects the team made for this blog-hop! I loved browsing them all. My favorite Thanksgiving dessert is Double-Layer Pumpkin pie. So delicious. oh so far im luvin this hop...amazing workers bees! fav dessert...hands down...my sis's strawberry cheesecake...any chocolate will do too...but this is to die for...and I have the hips to show how much I love it! Great job! My favorite dessert is Apple Pie with cranberries. Wow! Love all the amazing creations! So much inspiration! My fave Thanksgiving dessert is homemade apple pie. Honestly, it's the only time I make it anymore, which makes me love it even more! This is awesome - so thoughtful. Thanks so much! So many awesome projects, this was so fun, thank you! Your design team is wonderful! So many beautiful creations and inspirations! Thank You! My favorite dessert has always been pumpkin pie--especially my grandma's! As always, you guys put on an amazing hop! Fabulous projects!!! My favorite dessert? Hmmm, bread pudding with raisins and rum. Thanks for a chance at some cool stuff! always love these hops - thanks for all the inspiration. Pie - love pie - if there is cherry, then I go for that, otherwise pumpkin is on my plate with lots of whip cream. We don't celebrate thanksgiving here so do not have any favourite dessert. So many wonderful Tags and ATC's! I have so many new ideas to try. And my favorite Thanksgiving desert is pumpkin pie. My favorite Thanksgiving dessert is pumpkin pie. It's the only time of the year I make and partake it! 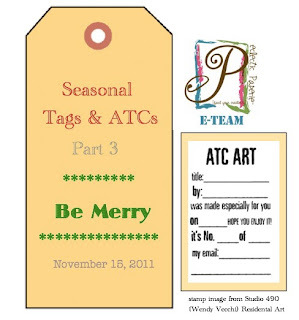 Great hop, and so many fabulous tag and ATC ideas! Love checking out the blogs for these creative ladies! My favorite dessert at this time of year is pumpkin pie with whipped cream! Lve all the projects featured - your team Is amazing! And I think the only real answer is pumpkin pie. I would have all year if I could! Daisy...you do the BEST blog hops! This one was jaw-droppingly wonderful. Favorite dessert for Thanksgiving? Pumpkin pie with real whipped cream. Yummy! Happy Holidays to you! Again, a fabulous blog hop with wonderful projects. Thank you. My favorite Thanksgiving dessert is pumpkin pie, but not everyone adds maple flavoring like my mom did and that was the best. Absolutely beautiful creations by the DT. The never cease to amaze and inspire me. My favorite Thanksgiving dessert is always the pumpkin pie. Great blog hop. Your right I'm ready to play with some ink! My favorite Thanksgiving dessert is Pecan Pie..yum. my favorite thanksgiving desert is pumpkin pie with plenty of whipped cream. yum! Thanks again for this awesome opportunity.! My favorite dessert is pumpkin pie of course with lots and lots of whip cream!!! Yuumooo!! Holy guacamole! What a great hop!!! Thanks for it! As for eats, yes, I love guac :) but for desserts... hahaha! The few that I DON'T like tend to be plain cheesecakes and things that taste like cream cheese or sour cream. :) Otherwise, pies, cakes, cookies, bring 'em on!! another awesome blog hop w so much creativity on display. thank you so much for putting this together and finding such great designers. Your design team just knocked this challenge out of the ballpark. Some really amazing creativity! Gets me motivated to start my holiday projects! My favorite thanksgiving dessert is apple crisp, which I make every year for the holiday spread! I enjoyed my first bloghop ... so delightful to see all the awesome creativity of the E-Team. My favorite Thanksgiving Dessert was my grandmother's Sweet Potato Pie topped with homemade whip cream and sprinkled with nutmeg/peacans and a cup of fresh coffee. Thanks south for the blog hop! The ideas were very inspiring. Oh yeah... Apple Pie of course!! Great blog hop-I am stoked with Christmas inspiration! Not too original but I love pumpkin pie-for me best when its nice and cold with a cup of coffee! Oh my all of these beautiful projects have me in the holiday spirit! Thank you for doing this hop! The design team rocks! What great projects I've gotten to see, simply amazing! My favorite Thanksgiving dessert is my mother's pumpkin pecan pie. It's a combination of both--pumpkin and pecan pie and is terrific!! Our family favorite is what I named "Gooey Bars". They're basically pecan bars but with LOTS of chocolate chips added. Loved the designs of your team! So many great ideas! Thanks! My favorite dessert is.....going for the leftovers and starting all over again. That's the best. After your food has settled and you've taken a little nap, what's better than eating some more of the wonderful food. I apologize, in my last comment I meant to tell you "Happy Holidays to you and yours." My favorite Thanksgiving dessert is Pumpkin Pie using my grandmother's recipe. She has been gone many years now but every Thanksgiving she is in the kitchen with me guiding my hands. Just wondering who the winners are?